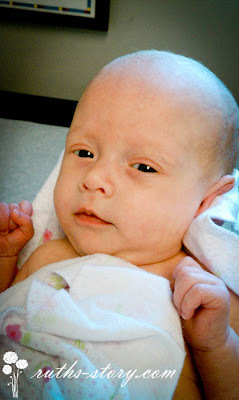 Ruth had her well baby checkup at the pediatrician today. The doctor was happy with her weight gain, and also very happy with the amount of movement she has. She is still not on the charts in weight or height, but they don't adjust for being premature. Head circumference is holding steady at about 10%. Yay! She also got a couple shots, and a oral immunization against roto virus. Still waiting on hearing back about getting her immunized for rsv. She goes back at 4 months old - not again for 2 months unless I have concerns! Of course, she has appointments at other places just about every week until then.